Some 4,000 Central American migrants left Mexico City yesterday and are now once again walking towards the US southern border. Most of them had been camped out in a Mexico City sports stadium for almost a week. Mexican officials stated that they have offered asylum to some 3,000 of them, but the largest part refused and vowed to move on to the US. 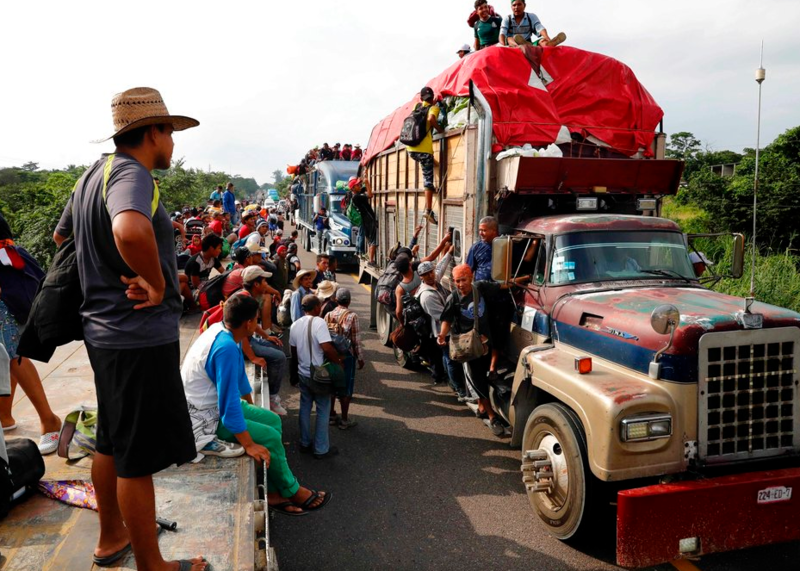 Meanwhile, two other caravans have merged together and are also on their way towards Mexico City. Asked by journalists whether the newly installed rules by the White House administration to tighten the rules for asylum seekers would deter them, most admitted that their plans had not changed. Related coverage: <a href="http://thegoldwater.com/news/41697-Caravan-White-House-Cracks-Down-Illegals-Entering-From-Mexico-Ineligible-For-Asylum"> Caravan - White House Cracks Down: Illegals Entering From Mexico Ineligible For Asylum</a>. Dozens, like Mr Elías, were tired of waiting after a week’s rest in Mexico city. They will head to the central city of Querétaro and from there it is on to the US border. US President Trump says the caravans should be labeled an “invasion” and his administration is deploying some 7,000 troops to secure the border. On Friday, via the Department for Homeland Security, he enacted a new rule to “suspend, for a limited period, the entry of certain aliens in order to address the problem of large numbers of aliens travelling through Mexico to enter our country unlawfully”. The White House claims the numbers so far this year speak for themselves. In the guidelines for the new policy, it states that 124,511 illegal immigrants were refused at southern border ports of entry in fiscal year 2018 and 396,579 were apprehended entering illegally elsewhere. However, NGOs have questioned the new policy. “Under international law, you cannot punish someone seeking asylum for entering illegally,” added Sarah Pierce, an analyst at think-tank the Migration Policy Institute. These enemy invaders should be shot and killed by the military if they should enter our country illegally. The 30 million illegals in the US should be rounded up and sent to prisoner of war camps and then deported after a lengthy prison term of slave labor. All the anchor babies within the last forty years should be rounded up with their families and deported now. California should be invaded by the military and become a military controlled region much as Germany was controlled by the allies during ww2. We Americans are silent and restrained now but if our enemies obtain enough of a foothold in the USA they will awaken the sleeping giant and be wiped out and we will not stop here but take out mexico and take back the panama canal that stupid carter illegally gave away!